W hen we asked people from the EKO project what they needed in their activities centre, they told us: decoration. The place should look as bright and welcoming as possible. That’s why we are really happy that our amazing Danish interns Carla and Amanda designed a workshop that up-cycles discarded textiles to bright strings of flags. 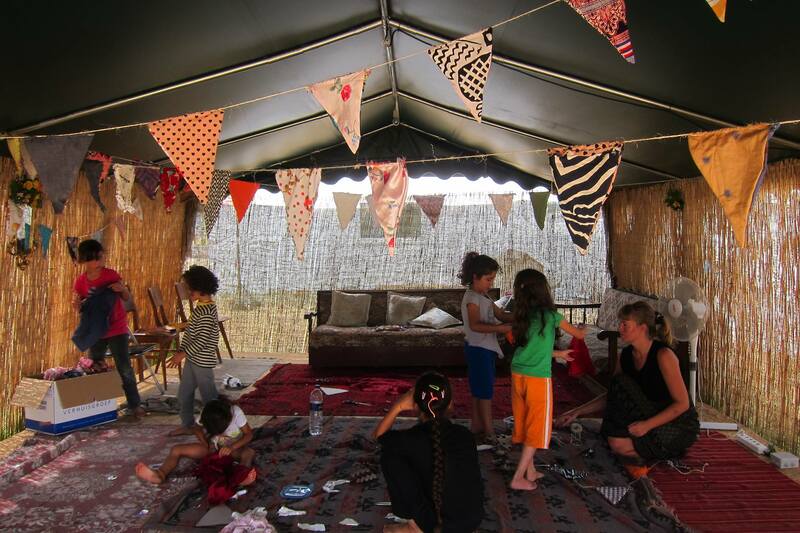 It proved so popular that we have continued the bunting making in the camp. People back home may be wondering if making bunting is the most urgent activity we could come up with… you could just buy metres of the paper bunting in IKEA for a couple of bucks, donate them to the camp and focus on more primary needs, right? Apart from the fact that paper bunting wouldn’t last long in a windy, rainy camp, there is a much more important reason we are making flags. Across the road there’s EKO project, an activities centre run by independent volunteers. 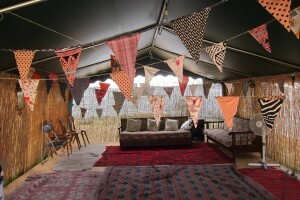 All the efforts of creating a camp are genuine and the atmosphere is telling. There is a school that offers some basic classes in English, Spanish and Arab. It’s lacking a proper curriculum, but the volunteer teachers are doing the best they can. There is a library that’s open every day but Friday. It only has a couple of books in English and even fewer in Arab, but the books offer some solace in an ocean of time. There is a women’s space that is only accessible for women over 14 year of age. It may be small, but it offers them some privacy while sewing, waxing and nail polishing. And then there’s us. Making flags, together with the kids, in the spirit of our core values: fun, empowerment and autonomy. 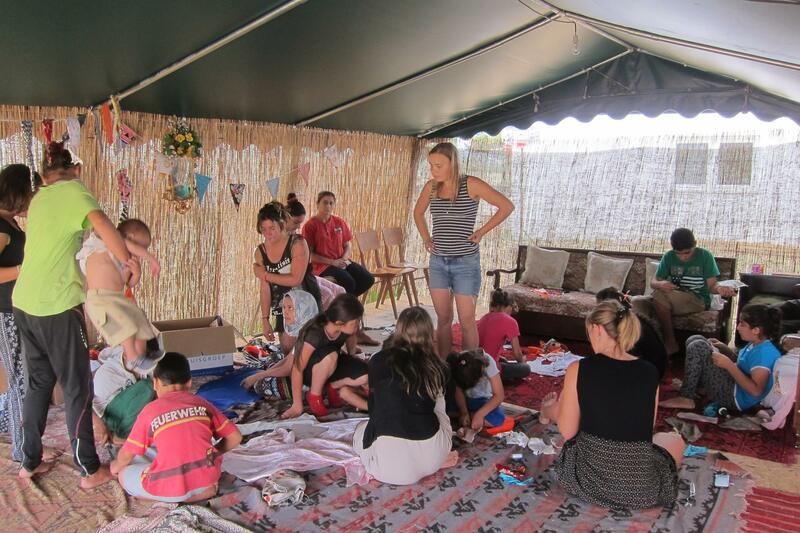 We take 2 hours to make approximately 10 meters of bunting with around 10 to 15 kids who come and go during the workshop. The first few workshops it was a challenge to work with kids that have too much time and too little to play with. Some children barge in, grab fabric, tools and anything that they can take. Sometimes it’s not even to work with, they just want to take it with them. The other day, this little boy came to us, proclaiming that he needed a flag. The 4 sewing machines we had broke down pretty quickly, as they weren’t used properly. We decided to leave our sewing machines at home which greatly improved the outcome of our workshop. More kids were able to join and the activity become more communal when we started to do the flags by hand. We may have been able to produce more metres of bunting on a machine, but by now you probably know that’s not really the point of our workshop. After doing the workshop more often the kids now know what to expect. You make a flag that gets sewn to a string. Together, we make something to cheer up the communal space, for everyone to enjoy. 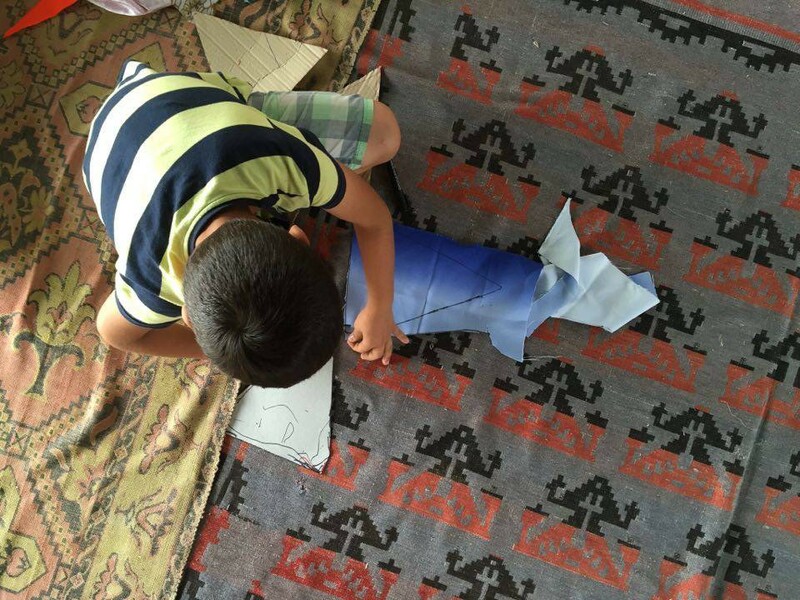 Today, something spontaneous happened that gave us confidence: kids started teaching other kids how to make a flag. 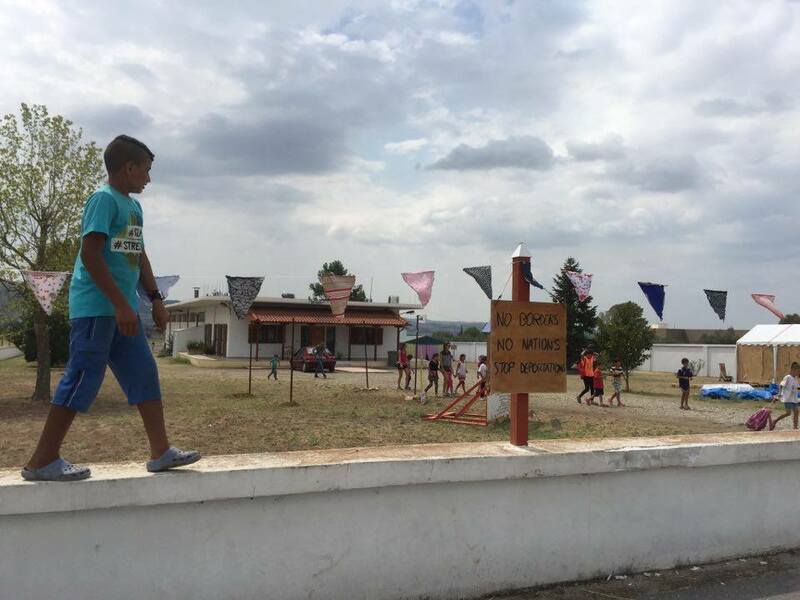 This also happened on Lesvos and we hope that the manuals that we are preparing will turn more students into teachers, reaching even a bigger amount of bored kids. Slowly but surely, we see that our workshop brings a communal sense of ownership and responsibility over the EKO area, plus the satisfaction of creating something together. We believe that the inverse is also true: decorate your life with bunting, and it will become a little bit better. Especially, if you made the bunting yourself.